Our bestseller—now better than ever! Enhancements to our regal replica of an antique corkscrew promise years of effort-free openings. A smooth-gliding, Non Stick coated worm removes corks (natural and synthetic) with a simple pull of the handle. Inner workings and grapevine-relief casing made of lasting zinc alloy. Antique Bronze finish. Can mount to your bar or a Stand. This corkscrew is synthetic cork friendly. BEST ANSWER: No, you have to buy a new corkscrew. We had an Estate corkscrew opener ,that we ordered from Wine Enthusiast, for years and years It opened 1000s of bottles of wine for us. When it finally player out, we ordered a new one (now called Legacy) from Wine Enthusiast. It opened one bottle, and then ceased up. We reported that, and Wine Enthusiast sent us another one. It did the same thing after a few bottles. We reported it again, and they sent us a 3rd one. Same thing. Can't believe they had such a fabulous product that lasted years, to be replaced by one with some kind of faulty "plastic" inside mechanism that couldn't handle the pressure of opening more than a couple of bottles before it failed. Wine Enthusiast offered to send us a 4th one, but we declined and asked that they let the manufacturer know of the problem. All this was over a few month period in mid-2014. Last week, I bought a Legacy corkscrew just like those received from Wine Enthusiast from Total Wine. It's working like a charmp, so maybe Legacy has fixed the problem. Yes. The manufacturer is the Rogate Corp. But I've had mixed results with parts. The latest required me to wait for over 6 months. Now I use an electric opener. To bad as legacy looks nicer and also puts the cork back in the bottle. I'd say dicey manufacturing...and not worth it. Yes you but they are impossible to replace. We have had one totally replaced and the new one they sen broke also. Never received the second one they said they would replace. Also bought one for a gift for my daughter that they also replaced for her. Hers still works fine. We used our legacy corkscrew less than 5 times before the corkscrew got stuck and wouldn't operate. We contacted Wine Enthusiast to return it and have never been contacted. We would not recommend this product. That is a good question. I wish I had the answer because I could use some replacement parts myself. Sorry I could not be of more help. Can the Legacy corkscrew opener be engraved? Yes but you are engraving on a curved surface in bronze so the skill level of the engraver needs to be very good and the print small. Hi, the corkscrew can not be engraved but we do carry item # 433 15 87 58 where the stand for the corksrew can be engraved. The cast iron handle snapped while I was opening a bottle of wine. Can I obtain a replacement handle? The Estate opener was given to us by our son when we moved into our home and has been very dependable for 15 years. BEST ANSWER: We have gone through 3 of these openers within the last year. Every single one broke. We finally gave up and ordered an opener from somebody else. Good Luck! I had an Estate one also that I loved. I actually thought I was getting another one. We haven't had this one very long I would check eBay for one for parts. I doubt it. Cast iron is also not repairable. Two pads came in the boxes, one goes between wine open near the clamp. Where does the other one go? BEST ANSWER: The other pad goes under the table between the clamp and table. This wine opener is not a good quality product for the price We bought a second one and it broke after a short time. We complained and it was replaced free of charge. But it didn't hold up. After 3 of these we gave up. They are a beautiful wine opener tho. It's a shame. Need instruction on how to put back together, where can I get them from? Can the legacy corkscrew openet be engraved? BEST ANSWER: I would take it to an engraver and find out. Mine is mounted on a stand and there may be room there to at least add a label of some sort. I had to replace the corkscrew last year and it has worked fine since then. I need a replacement cork screw for the Legacy Opener. Please advise on where to order a replacement cork screw, or, who will repair the cork screw we have. BEST ANSWER: Thank you for your question. We sell the replacement worm. Please call us at 1-800-356-8466. That is something you will have to order directly from Legacy Corkscrews. Do I need to remove the foil wrapper before pulling cork from the bottle? BEST ANSWER: Yes, always remove the foil from the bottle. This will allow the cork to come out much easier and your corkscrew will last much longer. No it is not necessary to remove the foil from the bottle before removing the cork. If mounting on a countertop, how much overhang must the counter have for it to hold on to? Thanks! BEST ANSWER: Thank you for your inquiry. You would need about 3" of overhang to mount the Legacy Corkscrew. If you have any further questions, please feel free to reach to a consultant at 800 356 8466. Thank you again. You need at least 3 inches of counter overhang for this device to screw down on the counter top. We bought the legacy wine opener but it only works like 1 out of 8 tries. The screw is coming down like it's supposed to, it just isn't sticking into the cork....weird huh?? BEST ANSWER: Please call our customer service department at 800.648.6058 and they can assist you with this. Thank you. Thomas, I was referring to the clamp that holds it to the bar. How wide does that open? My bar top is almost 2" thick (1 and 7/8" thick to be exact). Thank you! I need access to repair manual for the Legacy Estate wine opener, Where can I find access to a manual? BEST ANSWER: I received it from the company. Looking for replacement parts for an upright version of the legacy corkscrew. What is available? BEST ANSWER: We have replacement worms and guide slugs. I'm using the vine opener as manual says but it does not remove the cork. Pin goes into the cork but not removing it. BEST ANSWER: Please call Wine Enthusiast customer service so they can see if anything is wrong with the opener or the way you are operating. Just wandering if this product can also be used without being attached to a table or counter top. Or if anyone has had a problem with scratching your table or counter from this product. I've had two of these openers and while they are so easy to use, the internal machinery is nothing more than cheap nylon gears. Deceiving in view of the great looking exterior. Face removing a difficult cork, and you'll watch the opener die in one simple lever action. Simple fix by changing the materials if the manufacturer was so inclined. My daughter bought this for us for a Christmas gift last year. It looks sturdy and sharp on the bar counter. The internal corkscrew malfunctioned and bent and broke after opening about 20 bottles of wine. When I took it apart, the corkscrew is very thin and flimsy. I would not waste my money on another one. I am buying a replacement corkscrew for it only because of it's sentimental value. I plan to use another corkscrew for most of my opening needs. Worked wonderfully when it first arrived then about four months into it the handle mechanism would get stuck halfway up. Called and ordered a replacement part which didn't help at all. Called again and the rep said there's a 60 day warranty and that there's nothing they could do. Now I have a nice paper weight. The first item delivered did not work; the second, [...] does and well. Neither order had an instruction manual on repairs, particularly on replacing a screw worm which was bought separately. Bought this Dec. 12, 2012, didn't even last 1 year. Cork crew bends and jams the mechanism. We do not recommend the Legacy Corkscrew...too much money for such poor quality. Worked good for about 20 bottles. Started getting difficult on real cork bottles and finally would work only if one person held the bottle clamp with both hands and pushed up on the bottle and the second person operated the handle with two hands. 60 day warranty was too short as this began to fail about day 75. It is very easy to use. Does a great job of uncorking bottles, plus you can re-cork the bottle. We enjoy our wine, as a result the Legacy gets frequent use. However, the worm design only holds up for several months. We like the product but engineers need to go back to drawing board to design a stronger, more durable worm. I have had this replaced 3 times. Worm keeping bending and jamming up. Customer service sent me parts to fix...? NICE LOOKING, BUT DOESN'T WORK ON SYNTHETIC CORKS, PUSHES THEM INTO THE BOTTLE. It broke within two weeks so I have only one positive observation: your guarantee policy is excellent. Works well on all size bottle necks. Easy to Use and looks good on my wine cellar. I love this thing when it works. It looks great on the counter, and when it works, it works well. Two major problems: one, it basically does not work for artifical corks and some others - it pulls out of the cork rather than pulling the cork out of the bottle. More importantly, it is not well made. This is my 3rd one, which I bought on sale for a spare and/or for parts. The 1st two both broke, but I like to tinker, and cobbled together a working one out of parts from both and some modifications (e.g. replacing pins with bolts, etc) to make it more reliable. I give it an "OK"
Not as good as my previous opener. if you bend the screw, you are screwed and replacing it is not tinker toy science. so I bought a whole new one. 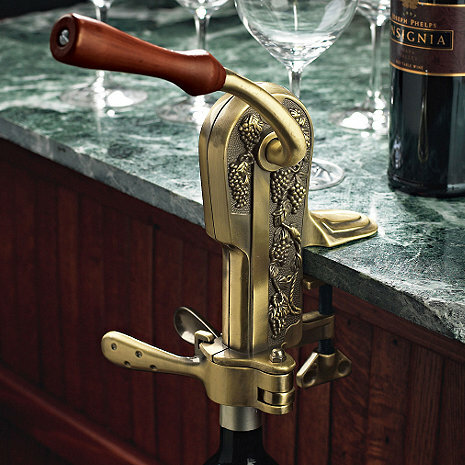 The original corkscrew lasted several years. I have gone through two in the past year, one lasted two months and this one about ten months. Looks better than it works! I really wanted to like this but after having to repair it many times as well as replacing the corkscrew I'm giving up. This looks great but if you actually need to use it all the time it just doesn't stand up. Even the screws are of a soft metal and strip after first corkscrew replacement. I like this product when it works, but the mechanism stops functioning after about 100-150 uses. There is a flaw in the design and needs to be replaced too frequently. I bought this unit to replace an old one that had worn bushings. the new one has much more clearance at the main bushing than the old one and requires more attention to be paid while opening a bottle to keeep the mechanism arm aligned. I got this as a gift, as my in-laws have had one for a few years and it worked great. However, the construction quality appears to have changed over the years. My corkscrew became bent and mangled after only 2-3 months of use. It's a shame because aesthetically it is a nice corkscrew with a heavy-duty exterior, but the guts are cheap. I cannot recommend this product. Like others have said, synthetic corks will kill this thing fast. I have owned two of these and have been underwhelmed on each. They are poorly made, with the inner workings made of cheap plastic. Both openers I owned failed after six months of average use - i.e. one to two bottles a week. I'd rather spend a bit more money on a higher quality opener that comes with a warranty. Have nothing at all positive to say on behalf of the Legend. Would not buy this again. This product did not last and broke easily. We bought a few of them and they are all broken. Not sturdy made and breaks very easily. Worm totally useless when faced with composite cork. I had similar unit that lasted for years and was much more sturdy than these newbies. If it wasn't so much trouble I would send it back. I have paid for and replaced this three times. I thought maybe it was just bad luck after two. The third one was it for me. I love the idea of the product, but the cork screw bends and is defective every time. I would suggest using better quality materials in your product. I see in the other comments that the same complaint is made a few times. I will not buy the brand again. I've now gone through 2 of these in less than 1 year. The internal mechanism wears out and at some point, when faced with a troublesome cork it will disintegrate. Bits of plastic and nylon come raining down out of the housing and you now have a rather elaborate paperweight on your hands. The reviews for this item are universally poor all over the internet. Spend some time looking for yourself. Avoid this until the manufacturer installs some quality control and revises this design and upgrades the inner workings. Internal parts are substandard. I've gone through two of these in less than 2 years, with light usage. Problems have been around for quite some time...look over reviews on the internet and you'll see. Why manufacturer won't fix the issues with this item is upsetting. Previous model was heavy and well made but simply wore out after MANY years of use; so no problem. This new version is very light duty and won't open bottles with synthetic, plastic or hybrid corks. Doesn't work at all with plastic, synthetic or hybrid corks. Works fine with real corks but who can afford "real cork" wine for every dinner. I've had it apart twice trying to line up all the parts so that the cork comes out---so far, no dice! I had one in the past and it never failed after hundreds of bottles. I just got a defective product, apparently. I received this product as a gift and it has never worked since cay one. It pushed in several corks and/or would not pull the cork out. I've used it on about 10 bottles and it hasn't worked one time. It looks cool and appears to be well made but it is a complete piece of junk. It takes up a ton of space and I will just be throwing it away. I've owned at least 3 of these over the last 15 years, and the longest any of them has lasted has been maybe a year before they basically just quit working. I honestly don't know how they are able to continue to sell such an unreliable product. Love this corkscrew. Minimal assembly. Easy to install and use. We already had the stand and just changed it out with the old model that we had used for 20+ years. So convenient and looks quite impressive on our bar. We use it daily, so need one that is strong and long lasting. It also re-installs the cork easily, if desired. Works on synthetic and regular corks. Works beautifully! Replaced an old Estate opener that wore out. I highly recommend the Legacy!! I purchased this as a Christmas gift for my parents. They will thrilled with the gift and impressed by the sturdy design. It attached nicely to a kitchen cart for home use. We gave this as a gift to our friend that loves to entertain as much as we do. He leaves it out on his serving counter. It's not only practical but also very pretty! Opens wine bottles with ease. I received this product 9 years ago as a gift and have loved the ease of opening and also recorking bottles. Guests always asked me where I got one and admired it. Recently I heard a snap internally when opening a bottle and that was it for the one I received 9 years ago. I had to buy a new one, no question about it. They are made really well, and I had used this opener on many many bottles. The new one is very well made and feels solid. No doubt this is a good buy, but you need a good place to put it. I use in our winery to pen wine bottles fast and easy to use. We were without this opener for a couple months - our first one wore out after a number of years. We finally decided we did need to replace it - for the ease of opening wine bottles. It started out as kind of a 'status' thing with my husband, I think, but it quickly became a necessity for us. And, it's a great conversation piece. Product was prompt, and delivered in good condition.